Once you cross the Golden Gate Bridge a new world opens up that is filled with grapevines, clean air, and small towns dotting the countryside. It is hard to imagine that just an hour outside of the City is something out of a storybook. Petaluma is one of those storybook towns. It is quite close to both Sonoma and Napa and has some amazing vineyards that I was happy to go check out. But Petaluma is more than that. It truly is a hidden gem of charm, with an old-town feel with a bit of modern sophistication thrown in. I kind of fell in love with it honestly. If I were to move to the Bay Area, Petaluma is at the tip top places I would head to, neck and neck with Half Moon Bay. Crossing the Golden Gate Bridge at Sunset… amazingly surreal with a huge touch of beautiful. When I was at the Ritz Carlton in Half Moon Bay visiting my friends Andy Grignon, Robert Scoble, and Sam Levin, I had the absolute pleasure of meeting Cecilia Enriquez. She was there showing her wines to Miko, the Sommelier. This was a night of epic proportions as there were a few winemakers in attendance pouring their wines for everyone to sample and enjoy. Heaven, really. Cecilia invited me to come out to Petaluma so she could show me her winery and the town I knew nothing about. We started the day out at her vineyard, Enriquez Estate Wines. I should mention that Cecilia is 27 and had no prior knowledge of winemaking before she moved across the US from New Jersey to follow her dream. You know I love when a woman follows her passion! This woman inspired me and reminded me a little of myself when I was her age. Her property is so beautiful and the gardens had just been planted when I was there. I can’t wait to hang out on this patio with the fire going and relax with friends with vino in hand. An estate vineyard means they grow the grapes, crush the little guys, and create the wine all on the property – nothing leaves until the bottles are sealed and in your hot little hands. I personally fell in love the Pinot Noir and Tempranillo Rose from Enriquez Estate Wines. Cecilia not only let me try her regular Pinot Noir, but her Reserve one as well. Then she broke out the Brisa which is a combination of Sauvignon Blanc, Chardonnay, and Muscat. O.M to the G. Delicious. The hands down winner for me was one I would never have suspected – the Tempranillo Rose. It was amazingly refreshing with just a little bit of kick from from those Tempranillo grapes. I am usually not a fan of Tempranillo, but this Rose had me singing a different tune in no time at all. I’m joining her Wine Club so I can have her wine delivered to me throughout the year, no matter if I am in Alaska or Arizona! You can purchase her wines online and they priced between $24-64. To kick off my tour in Petaluma, I started with checking into the historic Hotel Petaluma in the heart of downtown Petaluma. It was built in 1923 with 96 guest rooms and a 5th floor that housed employees. When you walk into Hotel Petaluma, it is like you stepped back in time. It is pretty freaking cool. There is not a hotel registration like you are used to, but a front desk person that is there with your key ready and walks you up to your room. Now that is service! The elevator was my favorite part. I had never seen anything like it, and don’t tell anyone, but I rode it all the time because I loved watching the old metal door open and close. I know, I am weird sometimes! Each of the rooms is decorated differently – which I found refreshing. I was in this beautiful large room that had the original hardwood floors, queen size uber-comfy beds (seriously refrained from stealing the pillows), and a flat screen TV with cable. What I loved was that the WiFi was fast and reliable and that there were electrical outlets all over. I might have lost myself in the tub a time or two as well. I have a separate post coming out that is just about Hotel Petaluma – stay tuned because I can’t say enough about this little boutique hotel. They really made me feel welcome, part of the Petaluma family. 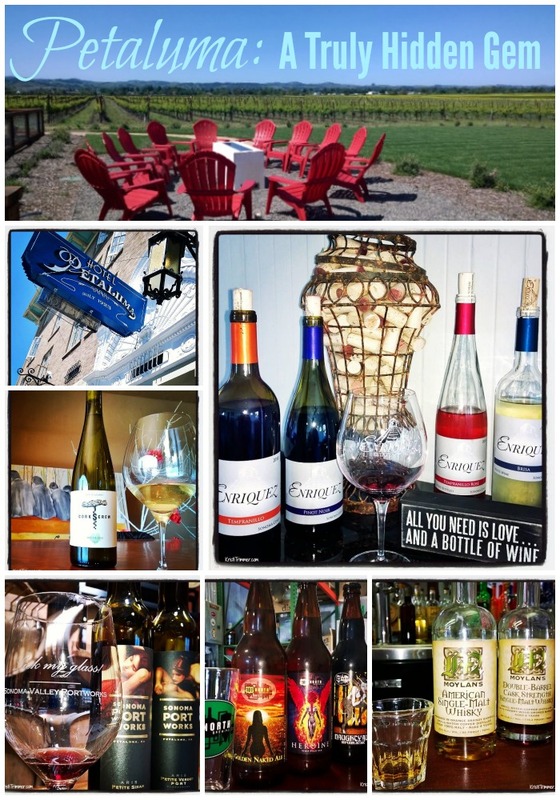 Cecilia and I went over to Azari Vineyards, also the home of CorkScrew Wines. Can I just say if you are a garden lover, run, don’t walk, over to this vineyard? I couldn’t believe my eyes – flowers everywhere. It was like walking into my ultimate dream vineyard. As I walked past the front door, there was a giant metal dragonfly on the door beckoning me in. Inside the tasting room were amazing paintings from the owner of the winery. I had the honor of meeting the entire family behind these amazing wines. The winery was started by Kamal and Pari and they just handed the reigns over to the tech-loving son, Kaveh Azari. I loved sitting and trying their wines and talking to the family. They know so much about the history of wine!! Their history of Petaluma was pretty outstanding as well. The Azari winery brand is their higher-end wine and their Zinfandel and Shiraz are on my short list of faves. I like my reds to be deep, bold, and crazy complex and these did not disappoint. I was one happy camper when I was sent home with a bottle of my very own. I have had the CorkScrew brand before, not knowing it was part of the Azari lineup. The Riesling is crisp, so crazy flavorful that I couldn’t put down my tasting glass. That good. I loved spending time with the Azari’s – what wonderful open, and caring people. I have never been a fan of port. I’ve tried and just have had a hard time with it. When we went to Sonoma Valley Portworks I didn’t expect to enjoy any of their wines. Boy am I happy to admit when I am wrong! I wanted to try them all to say I gave it my all… and try them all I did. My two favorites were the Deco and the Aris from Petite Syrah. The Deco is blended with decadent dark chocolate and I tried it while sampling a piece of chocolate. Melted in my mouth in pure bliss. That is dessert all on its own! I am now a fan of ports, well more specifically, Sonoma Valley Portworks! With all this wine sampling, of course I was up to shaking it up a bit and trying some spirits over at Stillwater Spirits. I have just recently started drinking vodkas after a long love affair with tequilas. I’m still working on whiskeys though. 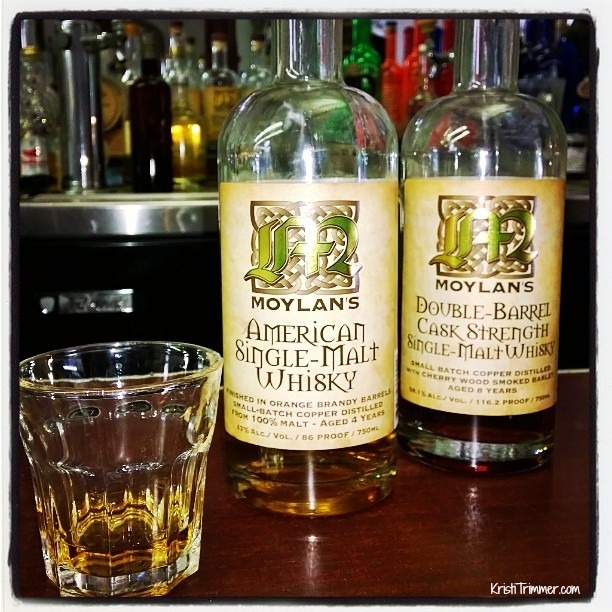 I tried the Moylan’s Award-winning American and Double-Barrel Single Malt Whiskey. Wow! Now, I don’t know crap about whiskey or how to rate them. With that being said, I loved how these smelled – so gentle and like a warm summer day. Weird description maybe, but it made me feel homey. The taste was a bit much for me but I could easily pick out the vanilla and caramel, which was really quite nice. 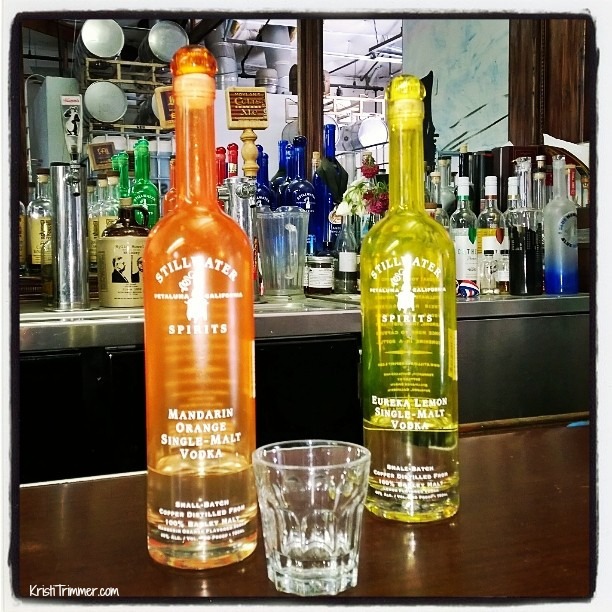 I tried both the Mandarin Orange and the Eureka Lemon Vodkas that were made right there in the Stillwater distillery. I saw the tree that those lemons were harvested from – right outside the front door! I thought that was pretty cool! I personally preferred the Mandarin Orange which was a shocker to me because of my love affair with lemons. I could easily see mixing these into my favorite cocktails all summer long. To round out my way of drinking touring Petaluma, we headed over to one of the area breweries, 101 North Brewery. This brewery is only a year old and is quickly making a name for itself. I was able to catch one of the partners and Brewmaster Joel Johnson for a quick photo. He is just a tad taller than I am. Just a tad. What is awesome about this brewery is that all the partners were college friends that came back together to pursue a dream they had back in the day. Each had honed different skills which melded well with the building a partnership to run a brewery. As you know, I am not a huge IPA fan, as the bitterness just isn’t my thing. I tried the Herione IPA with an open mind. It still was quite bitter for me but was more balanced than I was expecting. It might not be my first beer choice, but it is up there on the list of IPAs that I like. My favorite from 101 North was easily the Naughtaud Imperial Stout. I know you are shocked. Shocked, I tell you. 🙂 I am super excited to see the beers that this brewery keeps developing as I think they are definitely around for the long haul. That was just ONE DAY in Petaluma. I slept like a baby that night. We didn’t even have time to go on the cheese making tour! I won’t make that mistake the next time I am there. One thing I can say for Petaluma – they sure know how to roll out the red carpet and make each visitor to their area feel welcome. I found myself loving it there. Some of you know I am wrestling with the decision where to maybe put down some roots… Petaluma sure likes to sway me to come back to San Francisco! Maybe live half of the year in Alaska and the other half in Petaluma? Sounds like a good idea to me! Oh wow! Petaluma sounds like a dream! I can’t wait to be in the Sonoma Valley next week! Kristi, I am right with you on never really liking ports and having a low hop tolerance (though my husband is a HUGE IPA fan, the more bitter the better!) I’d love to check out these wineries and that brewery. I’ve only ever been to Lagunitas on my trips to Petaluma. So much more to see! Lots of people who don’t know that Petaluma was once the Egg Capitol of the World. There are a few egg farms left in our town. Petaluma Farms is one of them. Uncle Eddie’s Super Eggs are developed from the wild hen farm. They are cage-free white eggs. Hens are naturally raised without cages and fed with a special vegetarian feed. No animal by-products, no hormones and no antibiotics added. Shell Eggs are naturally GMO free. I am proud to add this news to our Petalumans. I live in Petaluma, and have never been to either of the wineries you went to, nor have I heard of them. It would be nice if you listed their addresses, phone numbers or websites for those of us who would like to give them a visit. I have been to the Sonoma Port Works and know about the 101 North Brewery and Henhouse Brewery, it’s nice to give Lagunitas a little local competition! Sorry about that Lisa – I will get the contact links in there over the weekend. This was a long piece that I needed to get out. I am so glad to see a little local competition – it is healthy!